All around us, everything is currently in bloom. Here in the high desert of New Mexico, this is such a brief moment in time that we had to capture it and share it with you. In reality, it is just another excuse to play with our fabulous, but slightly preowned cameras. For all the foodies amongst you, don’t worry, you have not been forgotten, our next gluten free recipe will be posted tomorrow. Brownies anyone? 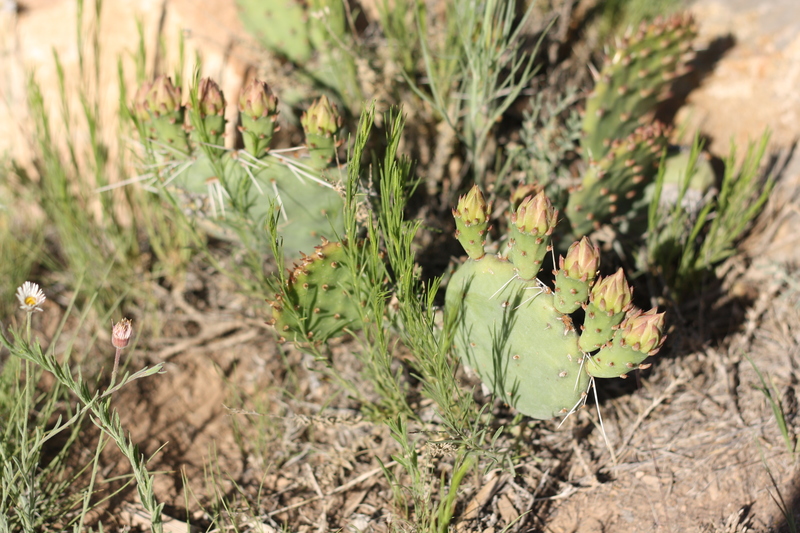 The prickly pear cacti are especially abundant this year, growing throughout our property. What a contrast, a plant with such sharp thorns producing such beautiful flowers. 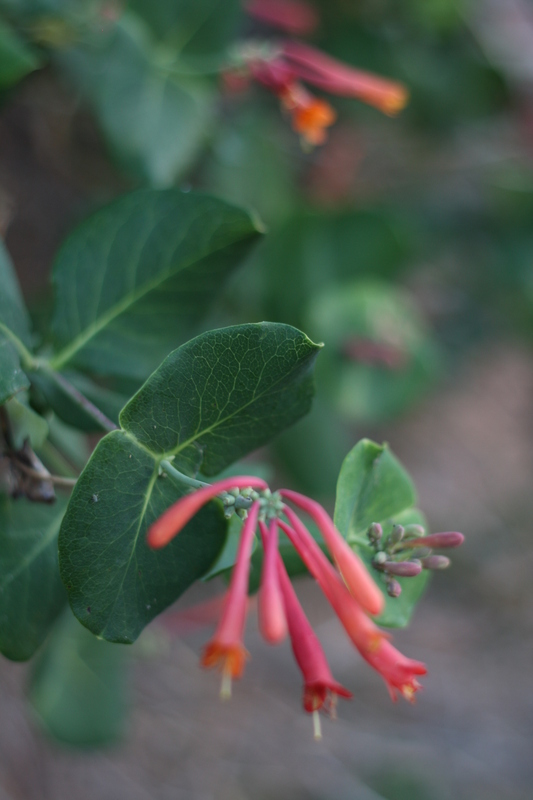 The local hummingbirds are especially fond of the desert honeysuckle, which is beautiful and vibrant in color, but sadly devoid of any scent. 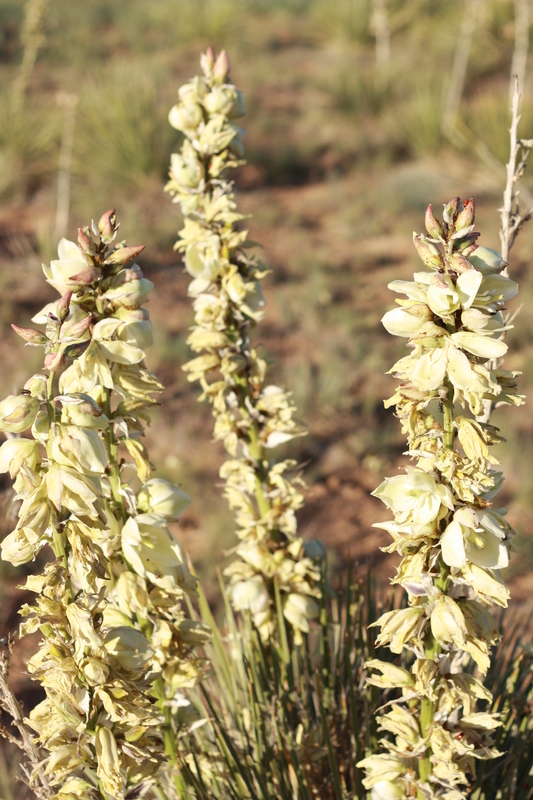 Yuccas are found everywhere in New Mexico (it is the State flower) and they easily self-propagate from seed. Their waxy blossoms produce a sticky nectar that attract a multitude of insects. 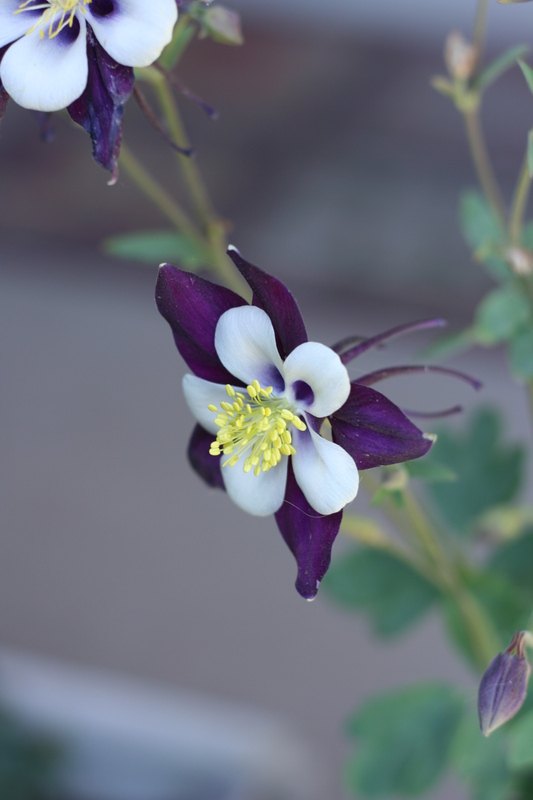 The beautiful columbine is a new addition in our garden, greeting visitors to our front door. 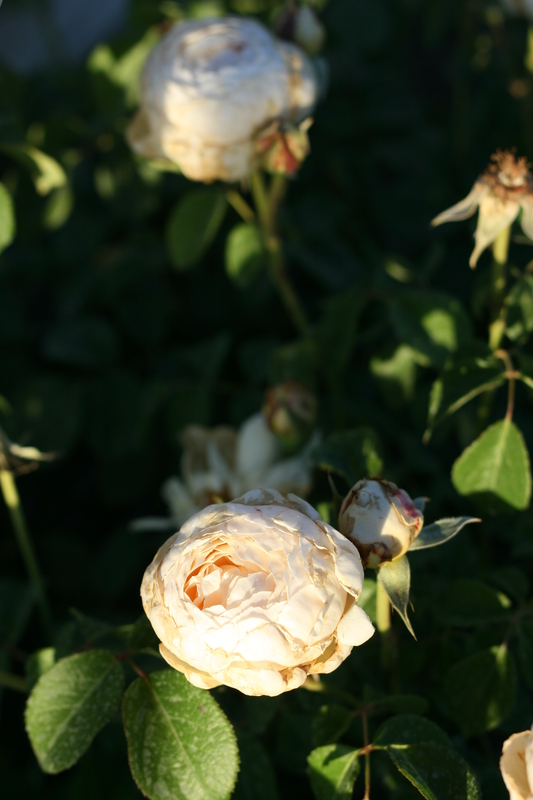 Roses, in all varieties, are our very favorite and can be found throughout our garden. To their credit, they appear to thrive, if well protected, in this impossibly harsh climate. 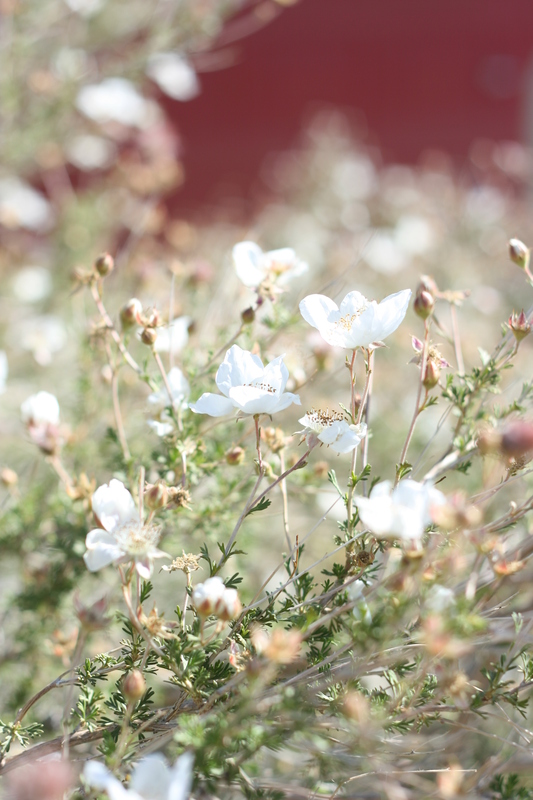 The Apache Plume is a native desert dweller, and believe it or not, actually belongs to the rose family. It provides a point of interest in the garden with its delicate flowers, and fuzzy pink seed heads. Our corgi Suki supervises all gardening activities and therefore, as “head rose gardener” deserves a special place of honor. 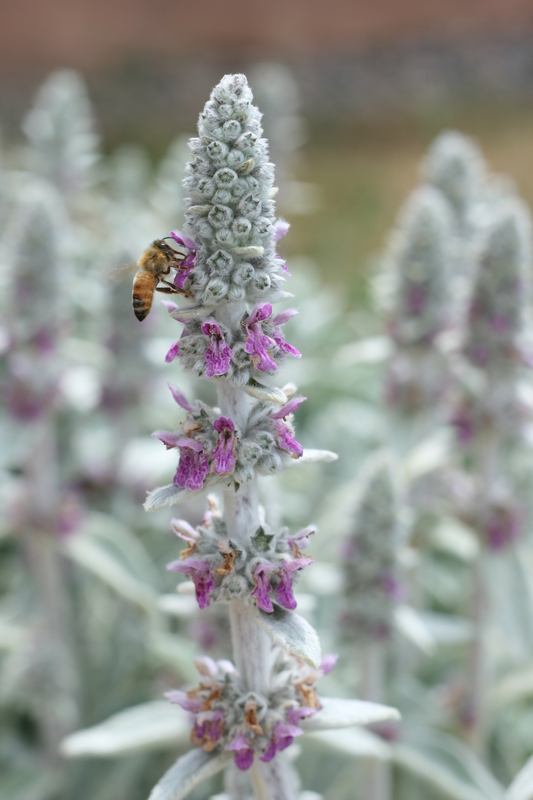 Lamb’s Ear is an interesting plant with soft fuzzy leaves, and small pink flowers, that seems to crop up everywhere in our garden, almost on its own, providing plenty of food for the bees. It took a little effort and patience on my part to capture this image of the bee on the flower. Every time I thought I had it, the bees would move and fly away. Herbs, especially sage in its many varieties, grow very easily here in New Mexico, soaking up the sun and the dry air. New Mexico’s largest fire in history, the Whitewater-Baldy Complex, has brought a huge amount of air pollution to our neck of the woods. When the wind direction is just right, you are almost led to believe that the fire is burning in our backyard, instead of nearly 130 miles to the South. It made for some spectacular sunset shots. Enjoy! Update, June 12, 2012: This post was Freshly Pressed! Many thanks to the beautiful people at WordPress for giving us your recognition and support. You rock! Ahhh! Beauty is all around you! I hope you are not close to the horrible fires! The fire is about 130 miles away from us, though we have been terribly impacted by the smoke off and on, triggering some people to ask whether this is in fact New Mexico, or LA on a really smoggy day. 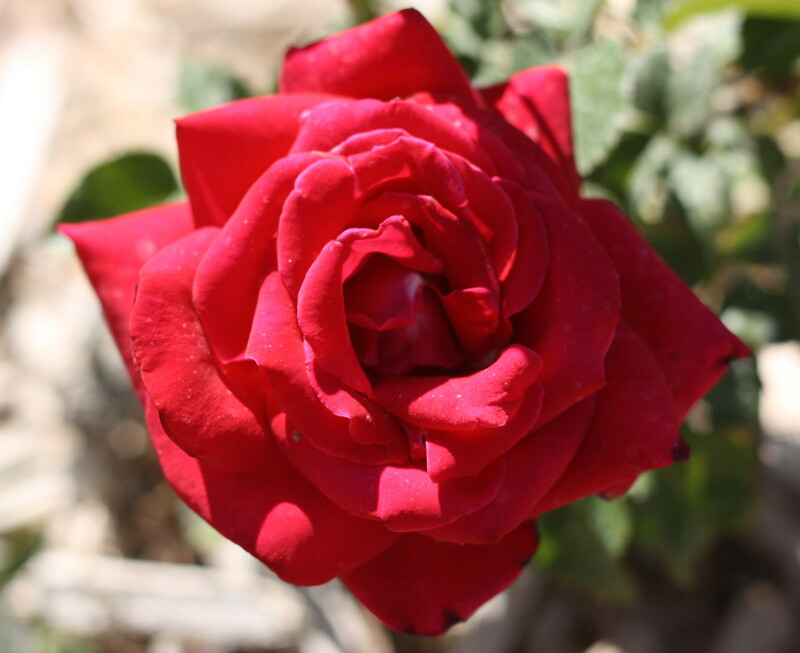 We cherish our flowers, which make the desert environment more bearable. Best wishes. What a wonderful series of photos! 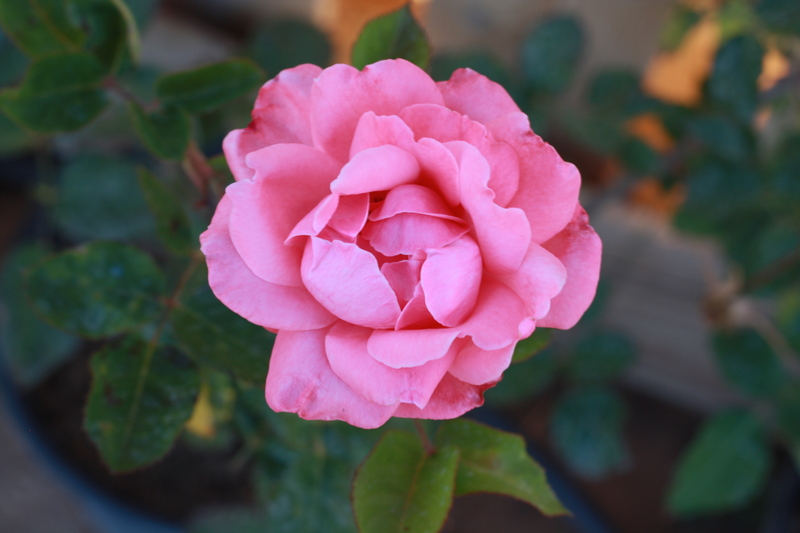 As a rose gardener I’m astounded to hear that roses can be grown in the desert! 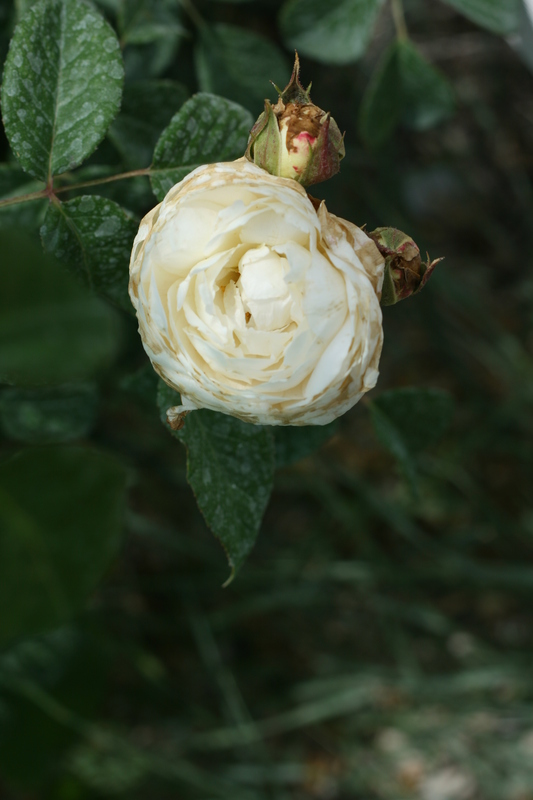 As long as we shelter our roses from the cold Winter, and drying Spring winds, they do beautifully. They do require intense daily watering, though. What we only do for the love of a rose. 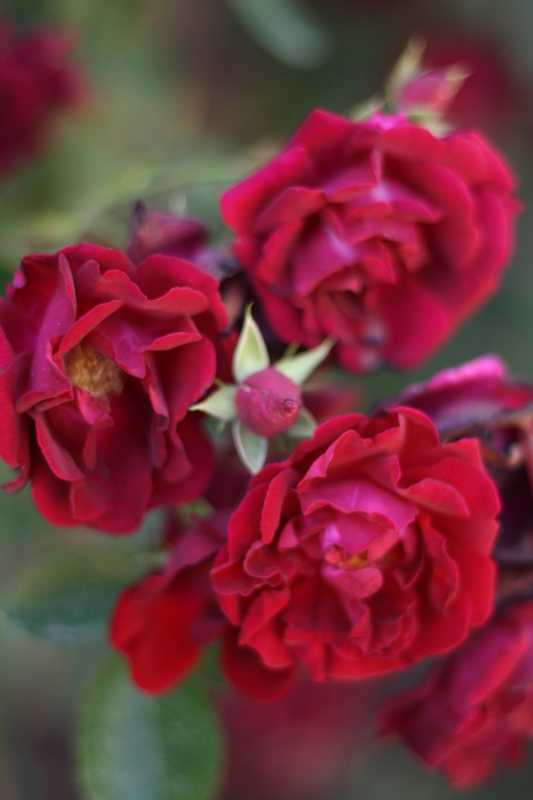 Albuquerque, however, even has a rose society, and an extensive rose garden near one of the public libraries, maintained by the community. Thanks for visiting. 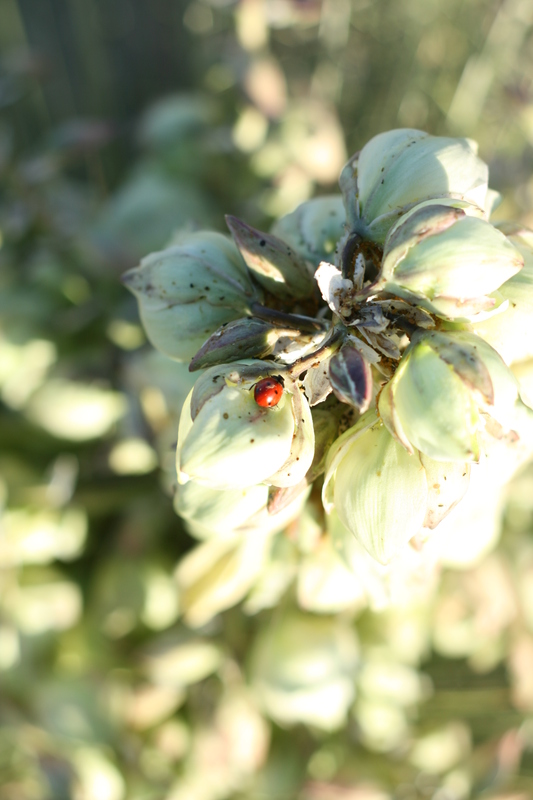 Ajene, we also love the ladybugs, which seem to be everywhere in our garden this year. They, however, present a unique challenge for us photographers. Beautiful. I dont get too see them often, barely ever, actually. What kind of challenge are you referring to? The challenge with photographing pets or insects rests in the fact that they tend to move very quickly. Only patience and a fast camera will bring success. Glad you enjoy them. Carlie, Happy you liked them. Sujana, so happy you enjoyed the photos, we loved taking them. Isn’t Suki’s smile beautiful? It’s her way of cheering up the world. Thanks for stopping by. What beautiful digital pictures. I hope that the fire didn’t destroy too many flowers and homes! Thanks for sharing! http://www.segmation.wordpress.com. Dianna, Glad you liked our post. 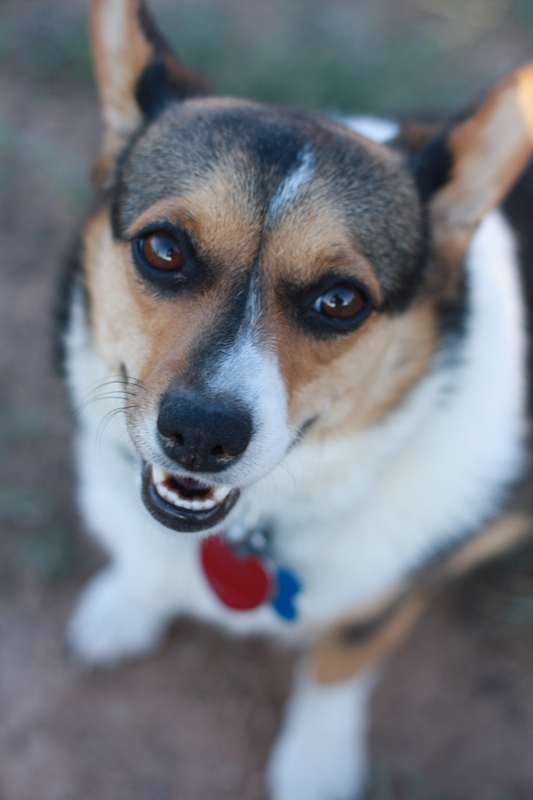 Our corgi loves all the attention, but prefers her supervisory role to “real” work. Thanks for stopping by. Beth, Thankfully, the fire is still a long way away from us but, as of this morning, several more have started up around the state. Could make for an interesting summer. Thanks for visiting. Cravesadventure, So excited to learn we are being featured on FP. Thanks for visiting. Nancy, our head gardener is flattered and trying not to let her new found stardom go to her head. Happy you enjoyed our photos. We love photography, though we are both still learning to perfect the craft. Love your site and your message. Being is what matters. Thanks. Your photos are beautiful. I would be interested in seeing them in a time lapse video. If you have ever thought of doing this check out this link for more info; http://cb75b4kdluln0871of2ybveuc4.hop.clickbank.net/?tid=DREAMWEAVER I think it would be something that would separate your photos from others. Thanks for suggesting the time lapse video. Will consider giving it a try. Happy you liked our pictures. Beautiful pictures! My grandparents live in Wickenburg, AZ and every year we take bets on when the hedgehog cacti will bloom, this really plops me back into my childhood. Gabriel, Glad you could revisit the desert through our images. Thanks. Cassie, Every place has its own beauty. The spectacle of color here is only very short-lived, depending on whether or not the monsoon season will actually materialize. So far, it doesn’t look promising. Thanks for stopping by. Fela2Fela, Hope your childhood memories are happy ones. Thanks for visiting. Thank you for sharing the beautiful photos. One of my favorite trips was going to Death Valley at around Easter. The desert flowers were in bloom and we saw Scotty’s Castle, wild burros, a road runner carrying a rattlesnake in its mouth, and much more. An hour’s drive out of the heat of the valley and up a mountain and we were snowed on! It was an amazing and unforgettable trip. Russ, Death Valley sounds like an interesting place to explore. Road runners and rattlesnakes can also be found here. We love the roadrunners, but tend to be very careful around the snakes. Last year, we surprised one underneath our garbage can, and it continued to sit there, rattling for hours on end, every time someone so much as opened the front door. We try to peacefully coexist with them, though. so beautiful! I have yet to see the desert in bloom – so jealous! Nicole, The desert is beautiful, but you also live in a beautiful part of the world – one of our favorites. The ocean will always hold a special place for both of us. Thanks for stopping by. Mowanling, Glad you liked it. 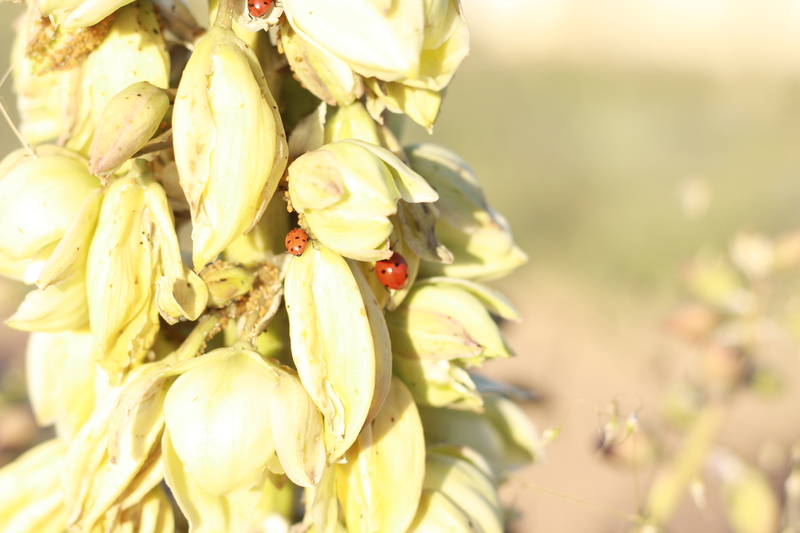 Alyssa, The ladybugs are very prolific this year, attracted to all the yucca flowers. Bbsolutely stunning. 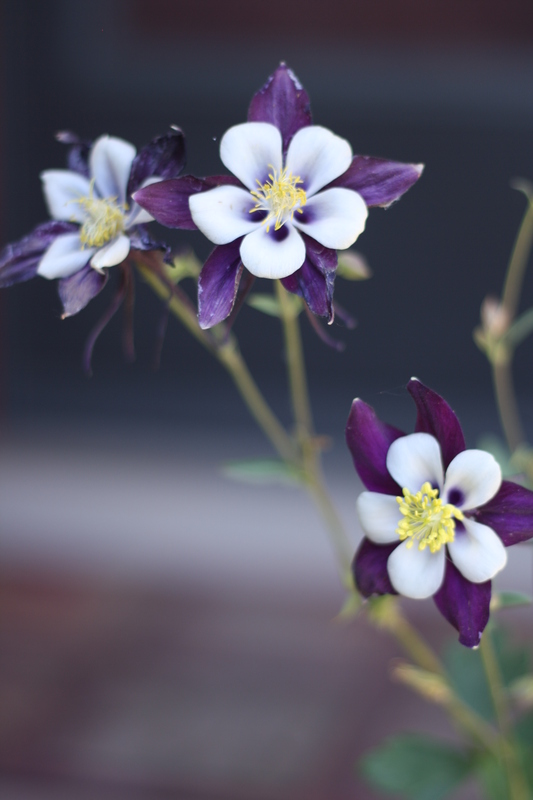 I like the columbine most. I showed my grandmother your photos, she just went crazy. She loves flowers! Jenny, we love the newcomer to our garden. Thanks for visiting. Courtney, Thanks for checking in. Glad you liked the photos. Wow, you take some great photos! I typically don’t like flower photos, but I really like yours!! The photo with the bee is amazing. Loved taking that photo, but it took patience. Turns out, bees just don’t want to sit still!? Loved your beautiful header image, which reminded me of the street cars in Stuttgart, Germany. Unfortunately, today most of them have been replaced by the faster, but less scenic, underground trains. Beautiful pictures. Reminds me of when I lived in New Mexico. I absolutely love the scent of lavender! It’s so divine! Beautiful photos and great post! Katie, Thanks. 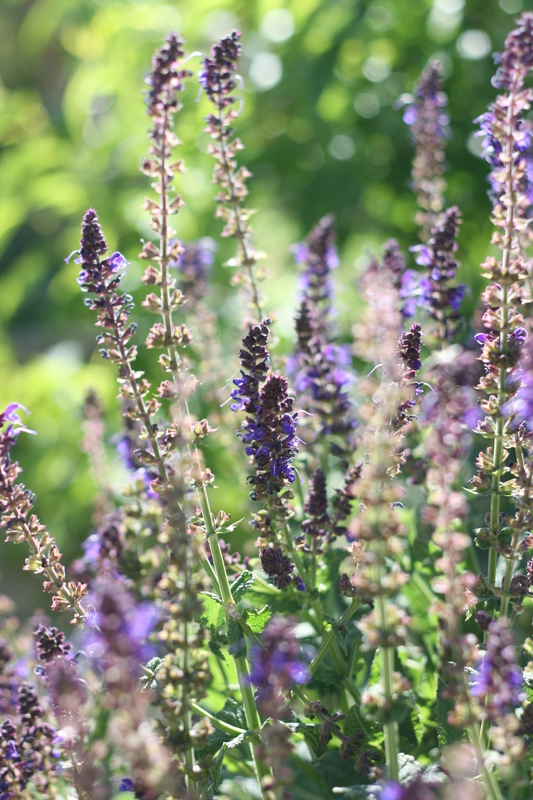 Lavender is a favorite of ours as well, although the photo is actually of a blue sage. Electric Echo, Loved hearing from a former New Mexican. You have a beautiful blog. Judy, Thanks for visiting. Glad the pictures provided you with inspiration. Thank you for sharing what it’s like in the desert in New Mexico. Nice pictures. Please feel free to visit http://germch55.wordpress.com for virtual tours of New York. Gerard, thanks for visiting and allowing us to visit New York in pictures. Flowers, ladybugs and a cute dog, what’s not to love about your gluten-free living post. I’m sure when you add your brownie recipe, that will just be icing on the cake. Thanks for the delightful photos. I’m also gluten-free, but in the rainy Pacific NW. Thanks for visiting. We used to live in the Pacific NW and definitely miss it, especially the rain. Love your website, with its beautiful images, and will visit it again. Lovely, lovely photos; thanks for the peek. I was trying recently to catch a bee on the lamb’s ears but figured all I was going to get was stung. They are one of the few plants the deer won’t eat. That purple columbine has my name on it. I have been to New Mexico a couple times and enjoyed it immensely. The West is beautiful in so many ways. Congrats on fresh press. We are so happy to see the return of the bees this summer. Last year we had hardly any, after such a cripplingly cold winter. Never want to go through that again. Lamb’s Ears are one of the easiest plants to grow in our climate. Since they continue to grow throughout the season, the bees never go hungry. True honey bees will rarely sting you unless provoked. They kind of ignore you after a while completely, so I wouldn’t worry too much about photographing one. A fast camera is key to success. Thanks for the support. Great post – beautiful pics! Excited to have found your recipes! I’m from Michigan originally, and living in Phoenix. Desert plants are so lovely! I felt very fond of my own desert home looking at your photos. 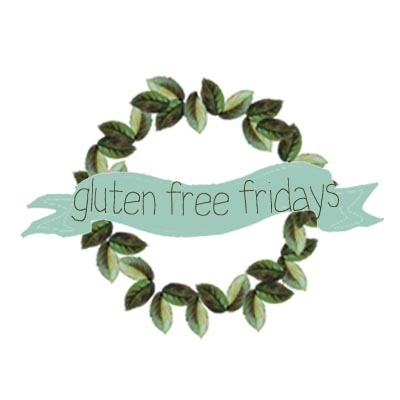 I have a gluten intolerant friend, so I’ll be coming back here for recipes! Thanks for visiting. The Phoenix desert differs somewhat from our High Desert. Arizona has mild winters, here we have snow and ice and cold harsh windy conditions. But the Spring flowers are beautiful in both places. Thanks. 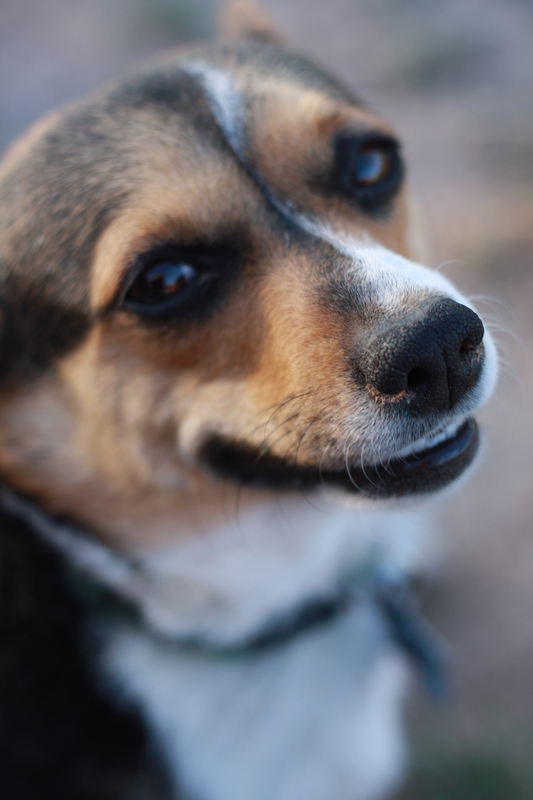 Suki puts a smile on everyone’s face. She doesn’t even have to work hard for it. Thanks for visiting. Such incredible photos! So much of beauty all around you! And I fell in love with Suki! 🙂 Congratulations on being Freshly Pressed! I always seem to be in the desert when plants no longer are in bloom. Would love to view this magnificent display. About what time of year is this best seen in? If you visit the High Desert of New Mexico, the best time of year for seeing flowers in bloom would be mid-May through early June, but it all depends on the year, the previous winter and how much moisture we have during Spring. Another good time would be just following the monsoon, late August through September. Good luck on your journeys. Thanks for visiting. What a beautiful place to live. As an English woman living in the Far East for a while I really loved the roses (made me a bit homesick actually!) lovely post thanks for sharing it. 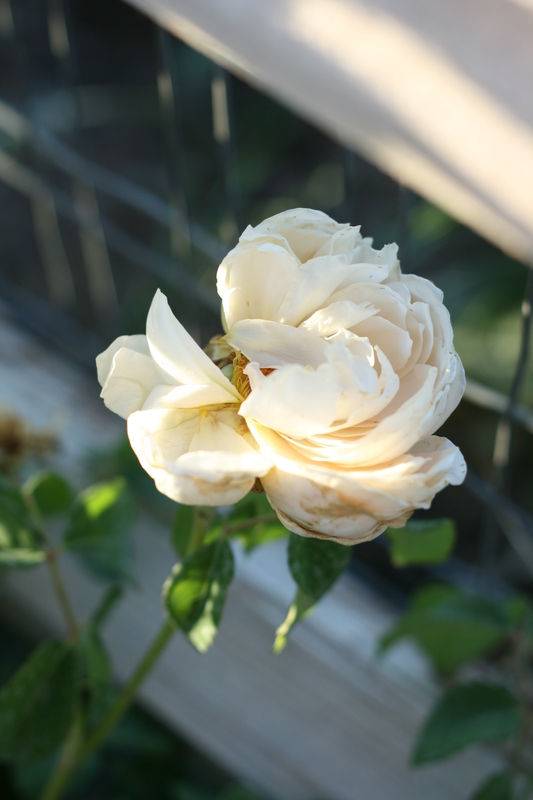 You are welcome.While we are able to grow and enjoy roses, our garden does not depict the typical English garden, where the beauty of roses is enhanced by green hedgerows and soft grass. Here we have to content with quite a bit of brown parched soil along with harsh drying winds. 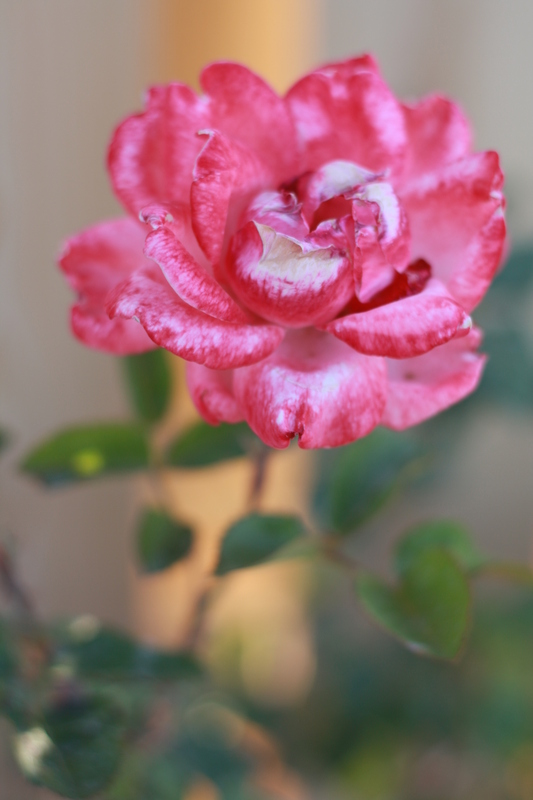 When a rose does bloom, it is even more appreciated for all that it has to offer amidst the barren desert. What an interesting journey for you, moving from England to the Far East. What incredible opportunities for photography and getting to know new cultures. It was great hearing from you. Thanks for visiting. Please stop by again. How well I remember the prickly pear from my years of living in the Yakima Valley of Washington. (And how well, too, the astonishment of people being told that most of Washington state and Oregon are four-season desert.) The translucent, waxy yellow blooms so close to the ground always seemed to elude an accurate photo. So just how would you describe it, other than radiant? Thanks for visiting. What sets the high desert of the Southwest apart from Washington (where we used to live) and Oregon, is the very high elevation and its constant lack of rain. And yes, the prickly pear blossoms only appear for one day, so other than radiant, the best description would be a fleeting moment of joy. Feel free to visit again. Suki is a treasure, loved by all. There’s something very spiritual about the desert. The combination of the beautiful and desolate conjure life itself; yin-yang. Living in the high desert, outer polar opposites, such as the extreme dryness versus the flooding monsoons, extreme temperatures during the heat of the day, followed by cool nights, among other things, offer a constant mirror all around, beckoning one to seek balance and stillness within. Thanks for sharing your views, pictures & lovely sunset in your part of the world! Everything looks so lovely & is blooming! 🙂 I enjoyed it very much! When the desert finally comes to bloom, it can be magnificent. We love photography, but are still perfecting the craft. Glad you liked it. The photos a breathtaki g. You dog is incredibly sweet. Best of wishes! Pets and flowers — how can you go wrong? Suki hams it up, of course, providing an easy subject for portraits.